1. Bidding for each copy starts at $1. All bid increments must be in whole dollars. (All amounts quoted here are in USD.) All bids are binding and non-conditional. 2. Each copy has a soft reserve of $80. This means that I am not obligated to sell the game for anything less than the soft reserve, though I may consider the highest bid if it is close to the indicated amount. However, this decision will be based solely on my personal discretion. 3.The game will be shipped, at no extra cost, to the winners directly from Stonemaier Games in December 2013. They have proven to be very punctual in their Kickstarter project fulfilment so far, so I do not expect any delays with regards to shipping. 4. This auction will end some time on 15 November 2013. The actual end time will not be disclosed in order to discourage sniping of bids. 5. Winners are requested to pay via Paypal within 3 days of the auction's conclusion, so that I can provide your address and name to facilitate shipping. As Stonemaier Games will be updating the shipping addresses of their backers in the third week of November, please understand that any delay on your part may cause a delay in the shipment of your game. 6. Both winners are responsible in ensuring that the address and addressee information provided to me is complete and correct, before I update the good folks at Stonemaier Games. Please understand that I cannot be held responsible for wrong information provided to me which may result in the failure of delivery of your game. 7. 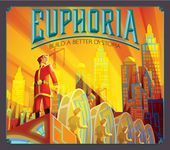 After the auction's conclusion, I will set up the respective Marketplace listings on Euphoria's BGG homepage for the winners to complete the transactions. This is to faciliate the payment of BGG's 3% commission. Jack Vasel Memorial Fund Auction - 2013 - CLOSED - TIME TO PAY AND SHIP! 1. If the winning bid in each auction exceeds the soft reserve of $80, I'll donate 5% of the amount to the fund. 2. If the winning bid in each auction exceeds $120, I'll donate 10% of the amount to the fund. 3. If the winning bid in each auction exceeds $160, I'll donate 20% of the amount to the fund. I hope this is an added incentive for those who participate in my auction. Good luck to everyone amd thanks for your interest! For those of you who have reservations about Kickstarter exclusives, please note that the exclusive items in the Supreme Edition are essentially aesthetic upgrades in the game board and components (e.g. resource tokens). They do not impede or affect gameplay in any negative way, as compared to the retail versions to be released later. If you missed out on the Kickstarter for Euphoria and wish to have an opportunity to win an exclusive copy for yourself, now's your chance! For those of you who have reservations about Kickstarter exclusives, please note that the exclusive items in the Supreme Edition are essentially aesthetic upgrades in the game board and components (e.g. resource tokens). They do not impede or affect gameplay in any negative way, as compared to the retail versions to be released later. If you missed out on the Kickstarter for Euphoria and wish to have an opportunity to win an exclusive copy for yourself, here's your chance!